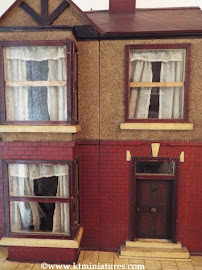 Have not been around these past couple of days or so, as I've been taking a short break in lovely Liverpool with Mr KT Miniatures and two of my three offspring. My eldest has lived there for many years now and we all absolutely love the place! 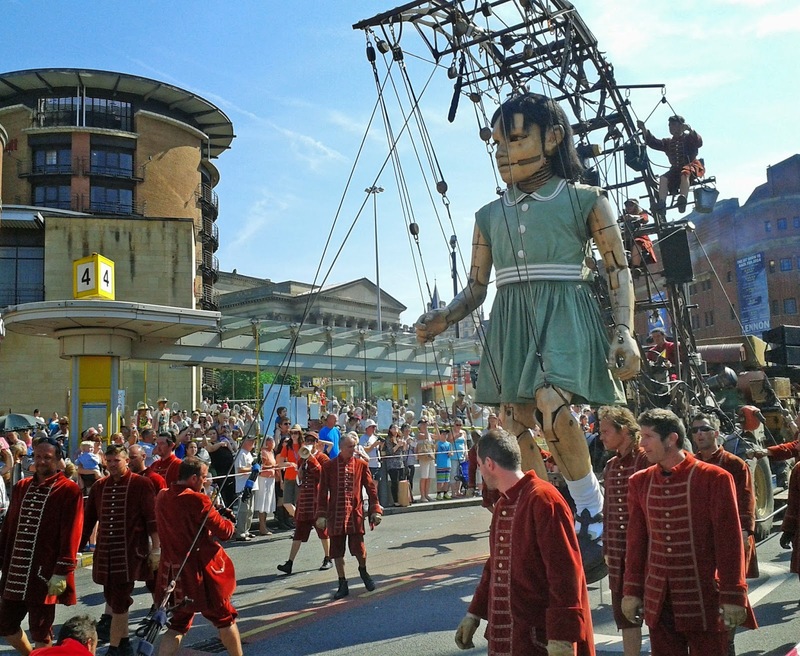 When we heard that "The Giants" were coming to Liverpool, we jumped at the chance of seeing them. 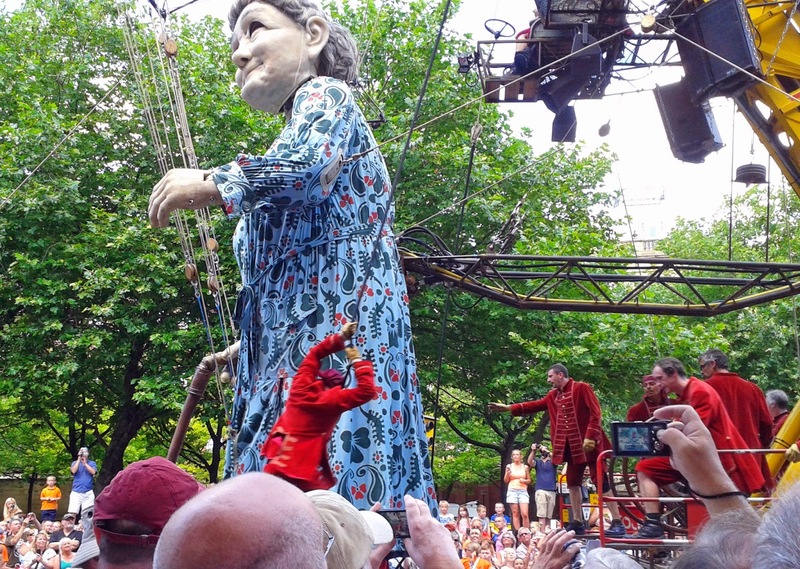 Grandma Giant was to tell the story of the many Liverpudlians who signed up happily to the Kings Regiment in 1914....the innocent Liverpool pals who went off to war thinking they would experience adventure overseas and be back in time for Christmas! 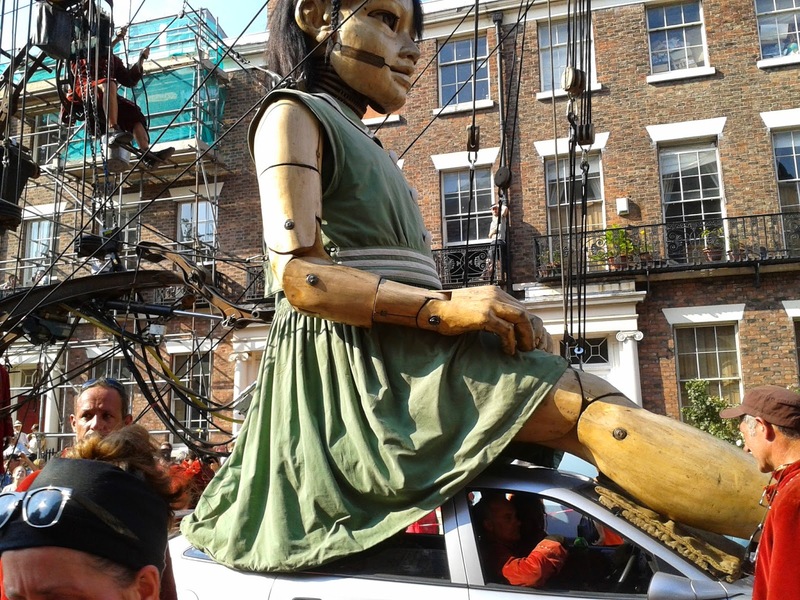 We did not see her "speaking" as our time did not allow, instead we watched Grandma Giant and the Little Girl with her dog Xolo parade past. I have never seen anything like this before so decided to share my photos with you on here...hope you find them interesting. 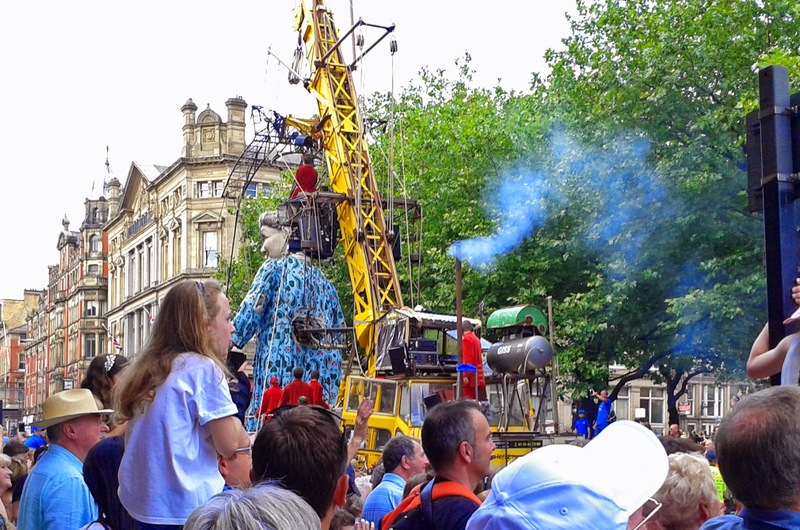 We chose Friday to watch the three day parade event, the day when the giants were based mainly in the city centre of Liverpool...it was an absolutely scorching hot day but the atmosphere was truly wonderful and great fun. Thousands of people stood wherever they physically could in order to see. 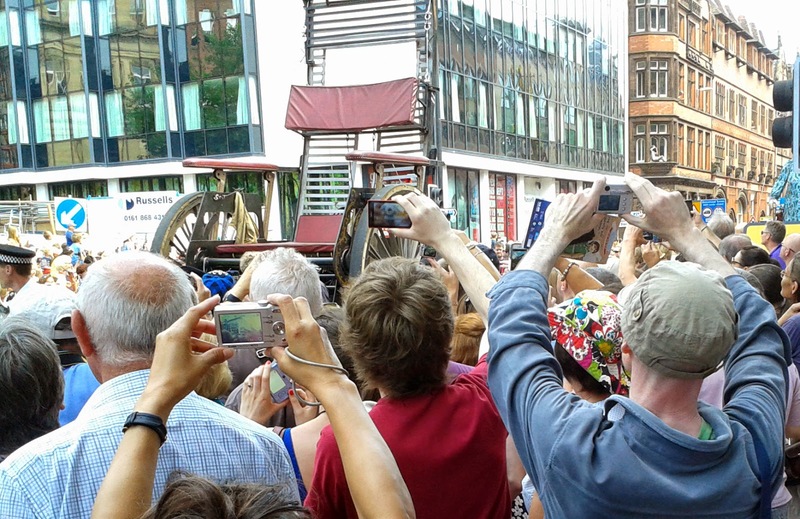 Some perched precariously high up on window ledges or on top of buildings, office workers stopped work momentarily and hung out of office windows...we managed to find a gap in the crowds on a pavement. Everyone was so happy and friendly, there was much anticipation and a real sense that this was a very special occasion for the city. 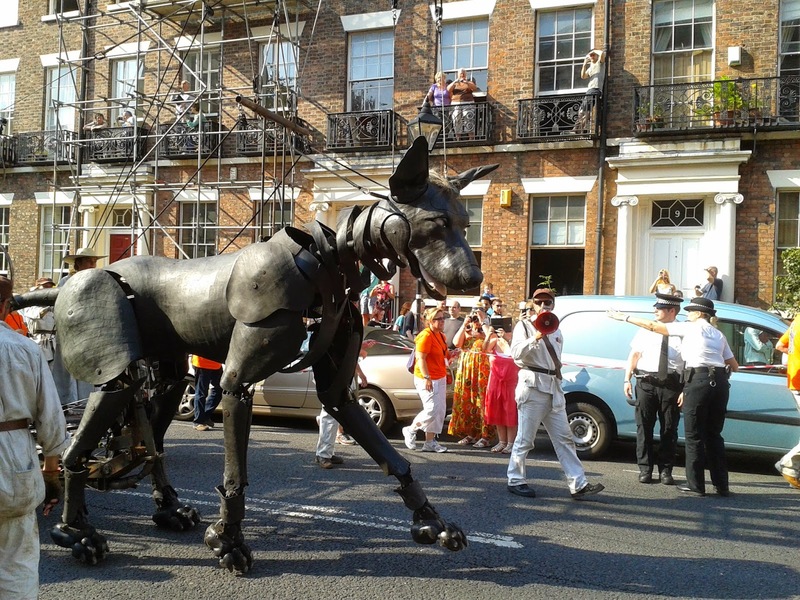 First came Xolo, the giant dog. 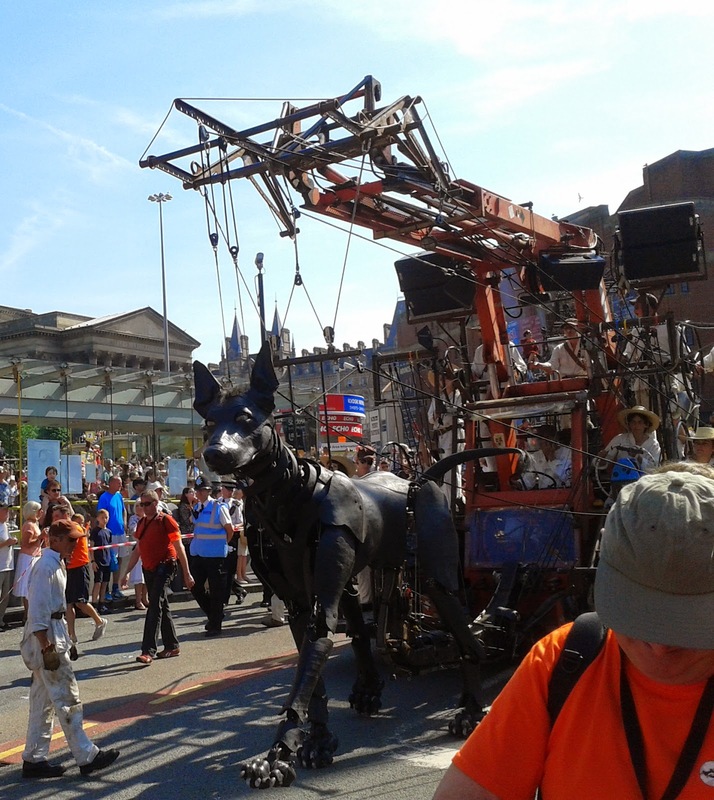 The sheer magnificence of the whole marionette took my breath away....with so many puppeteers pulling wires all over the place in order to make Xolo walk, move his head etc. was magical and absolutely fascinating. 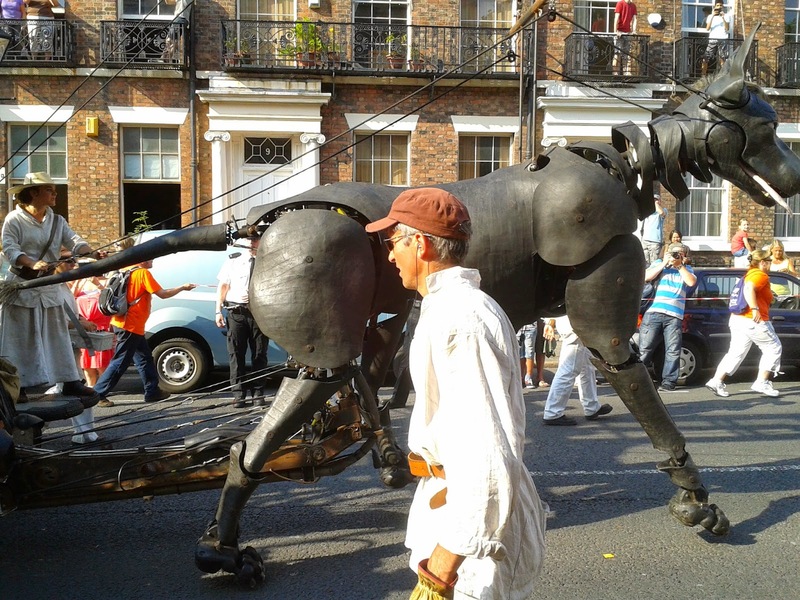 I have better photos of Xolo further down the blog as we saw him and the girl later in the day, by chance. 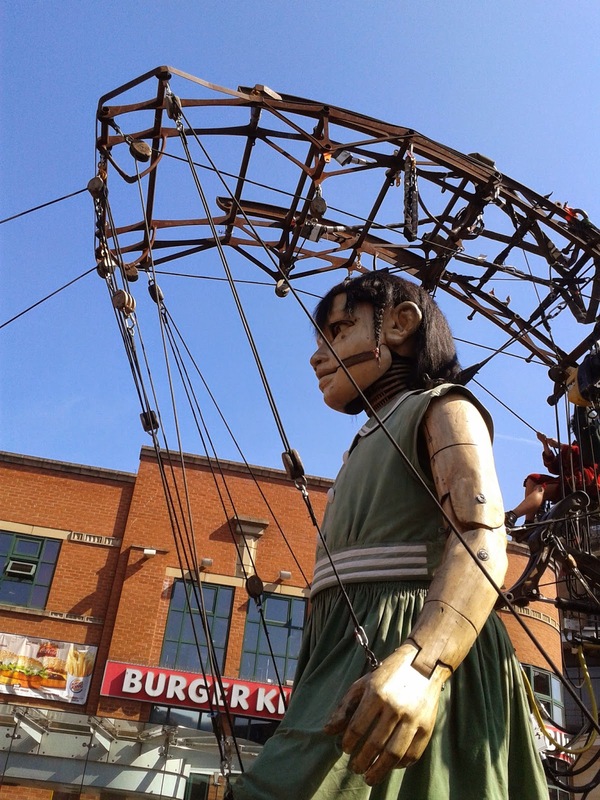 Then came the Little Girl Giant..she was big - about 18 feet high I think! She walked, moved her head, blinked....absolutely incredible. 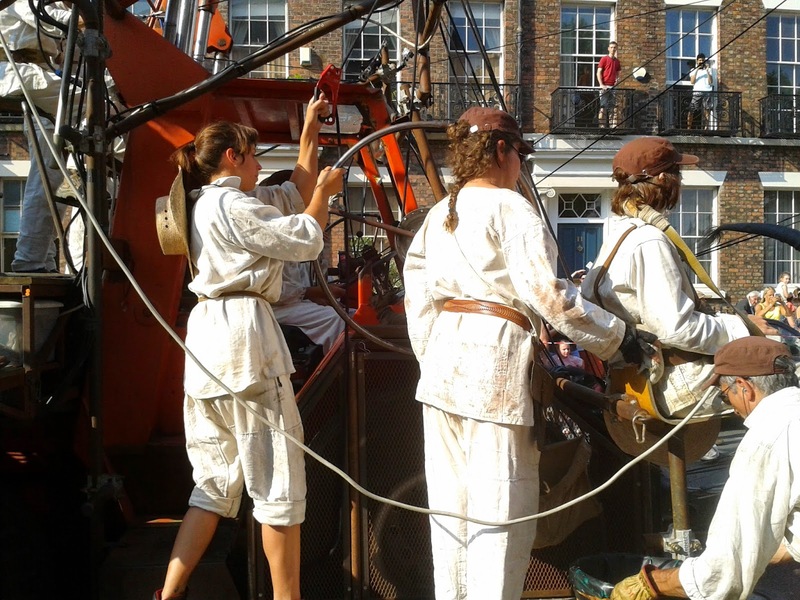 The puppeteers must be incredibly fit as the ones on the ground had to constantly take it in turns to leap up and pull on the ropes at the front, in order to make her legs move. 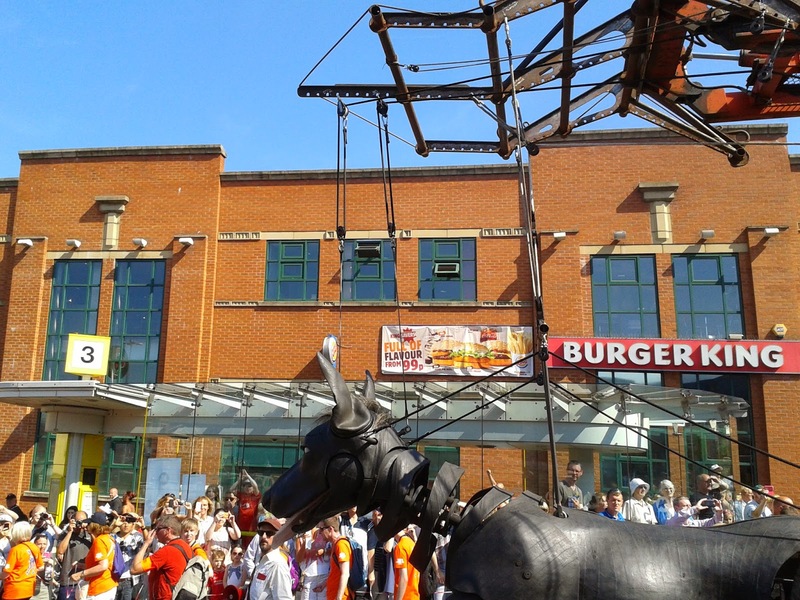 It was soooo hot, everyone felt really sorry for those poor puppeteers in their big heavy red jackets! 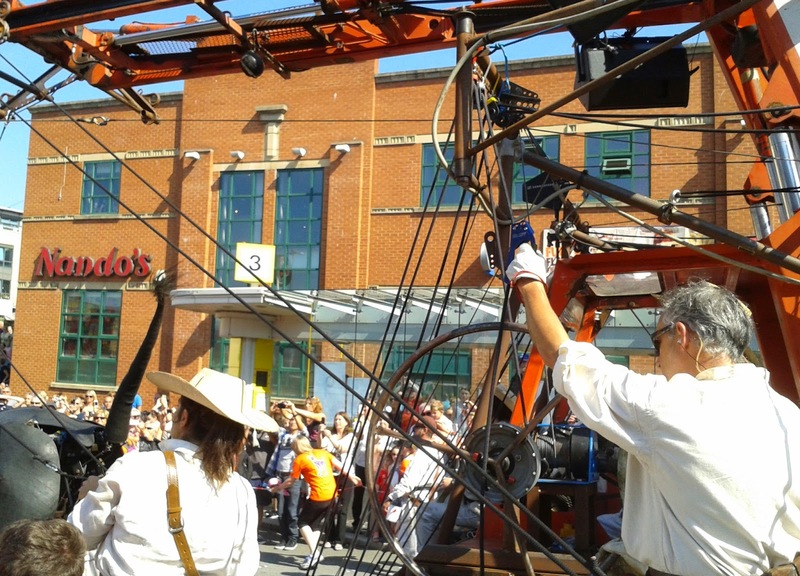 There were also several puppeteers perched high on a special kind of moving crane contraption behind....again, it was fascinating to see all the wires and how they each were working in tandem to make the giant move. 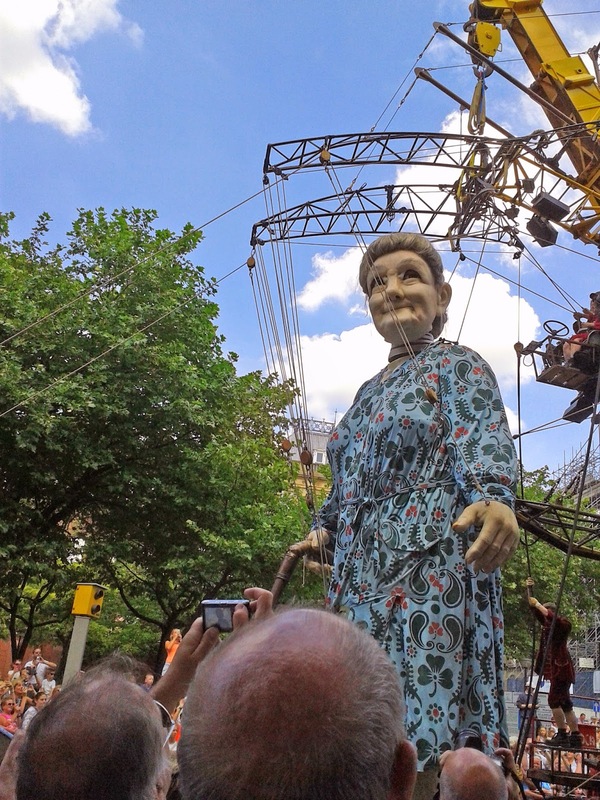 Then we had to move along to another road round the corner, to see Grandma Giant who had been woken up from a deep sleep where she had been lying on a giant bed in St George's Hall for a while. Actually, her giant wheelchair came first, then along came Grandma herself. She was enormous...approx. 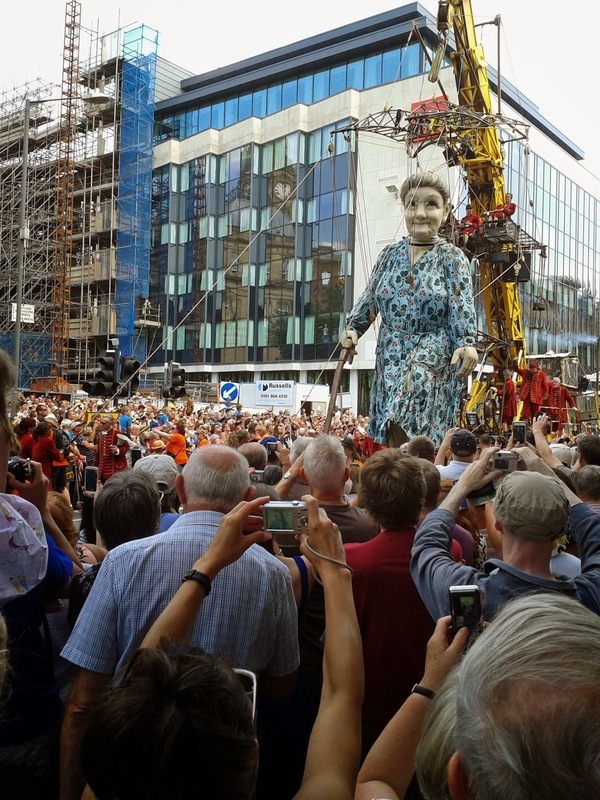 25feet high (a few feet higher than her granddaughter) ....what a sight she was! She even dribbled....haha! She even had a giant walking stick in her hand. 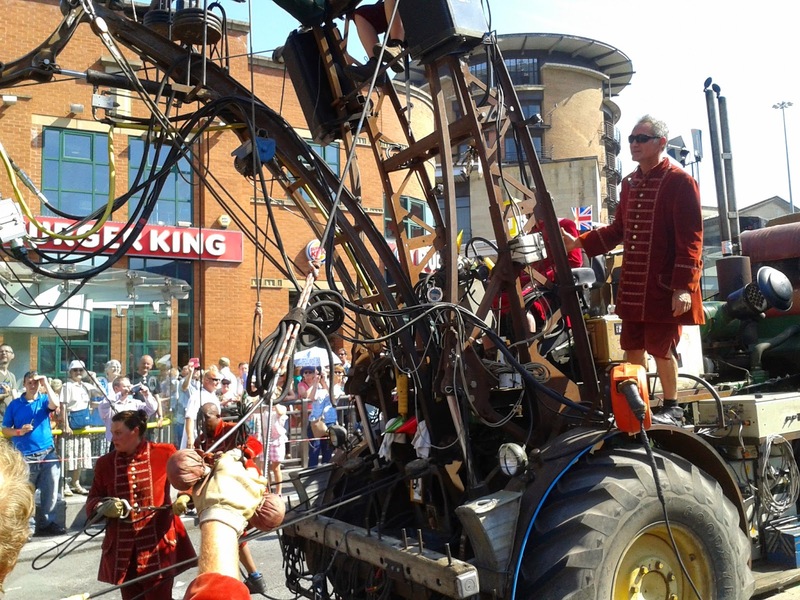 The poor puppeteers in their red coats had to take it in turns every few seconds to continually jump off the front of the following move crane contraption to yank on the rope to make Grandma walk! 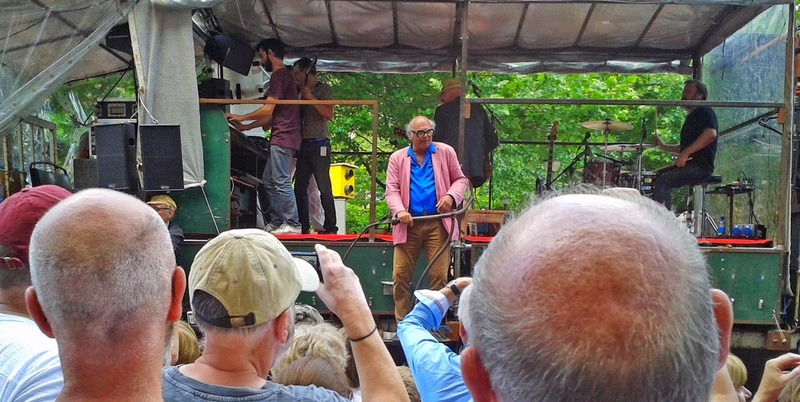 Behind came the very eccentric French gentleman with a musical band, who I understand was the artistic creator of these giant marionettes- Jean-Luc Courcoult - he is the one wearing giant size glasses and a pink jacket! 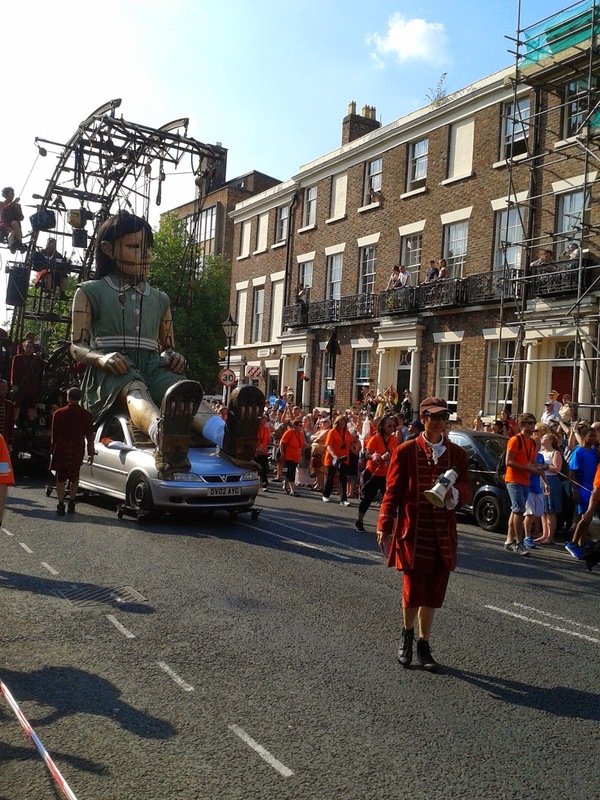 Later in the evening....as we were making our way to a very nice restaurant in Hope Street for dinner, we happened to come across Xolo and The Little Girl Giant once again. They were going past at the end of the road where our restaurant was and by pure chance, we had a much better view this time....so I managed to take more pics. As we were perched at the top of a hill, right by the Anglican Cathedral....we were not surprised to see the Little Girl hitching a lift on the top of an old car........everyone had been wondering how those poor guys swinging on ropes to make her "walk" were going to get her up the hill....haha! 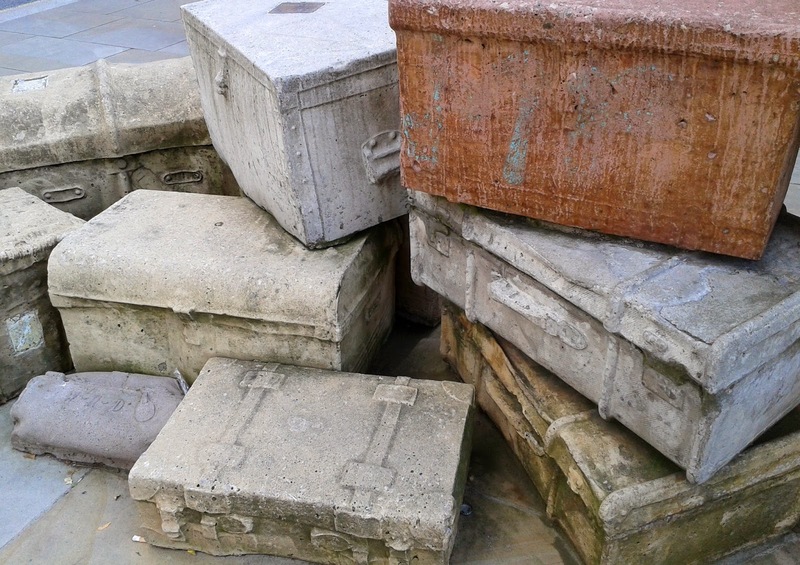 And finally, as I was walking past these...I just had to take some images of John Kings wonderful suitcase sculptures that are situated in Hope Street. 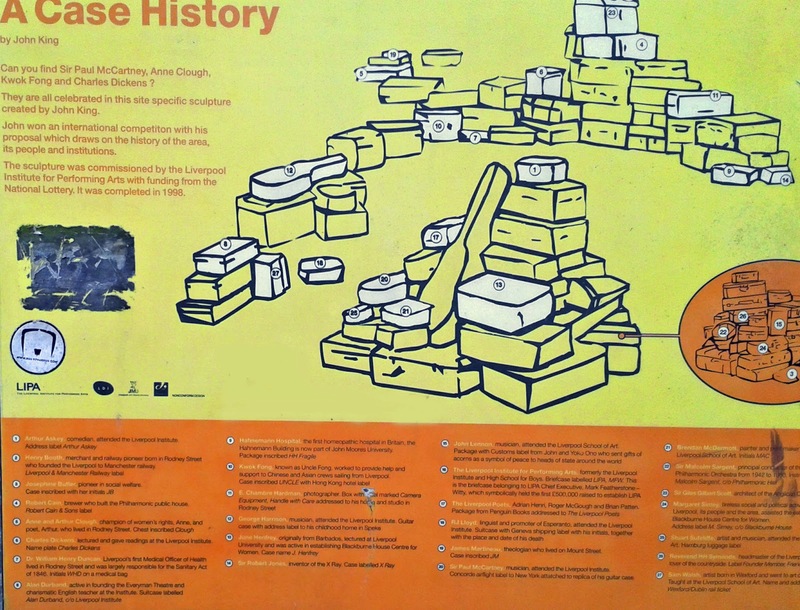 They look like random piles of stone suitcases but many have a plaque with a name of someone who has special significance to the area. Hope you've enjoyed seeing all the pics.....now I have to get back down to some serious work! 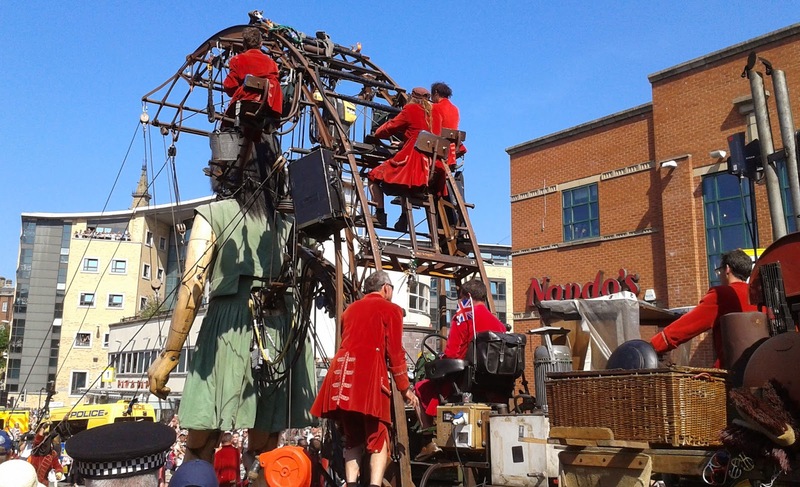 Meanwhile....here is a brilliant video of the Giants in Liverpool. 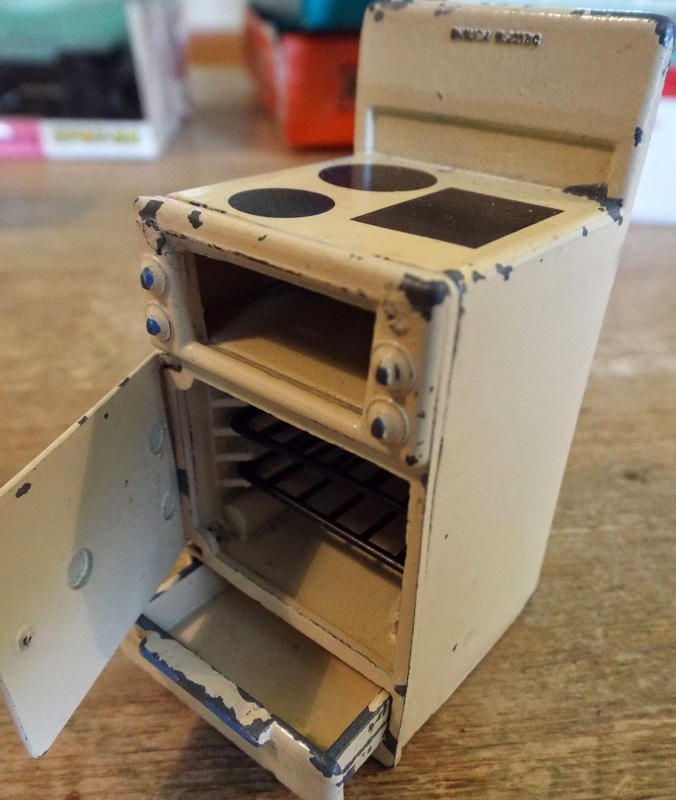 Two fascinating and very different miniature kitchens are now up for sale on KT Miniatures website. I have had to undertake a little research in order to attempt to identify them. 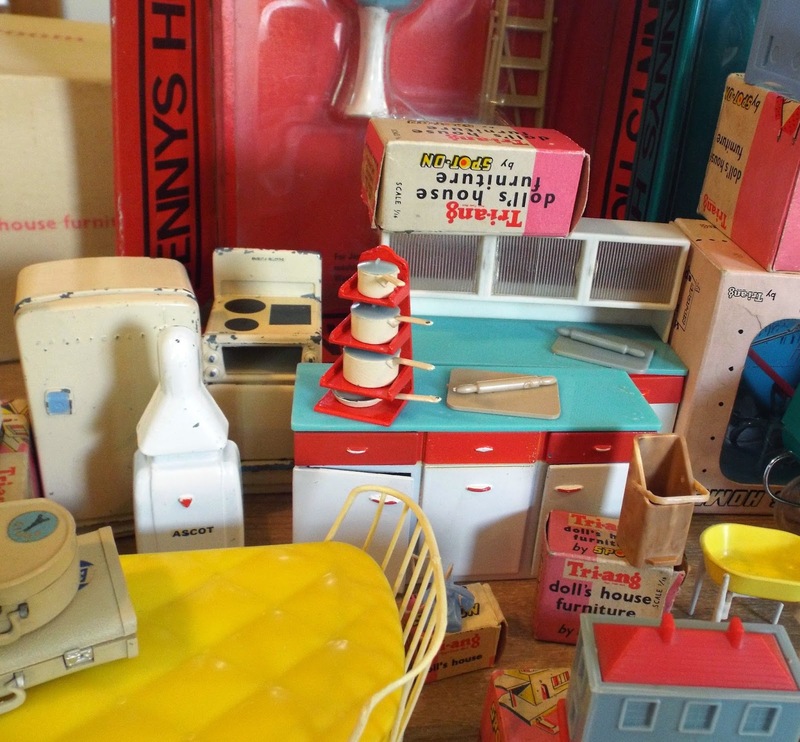 The first one I am certain is a German c1950s Crailsheimer dolls house kitchen...and it is lovely. 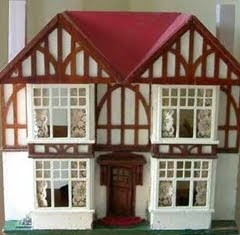 It would fit nicely into a 1/12th scale dolls house. It consists of a wooden all in one unit, with pastel coloured opening doors plus sliding stripey glass doors at the top. 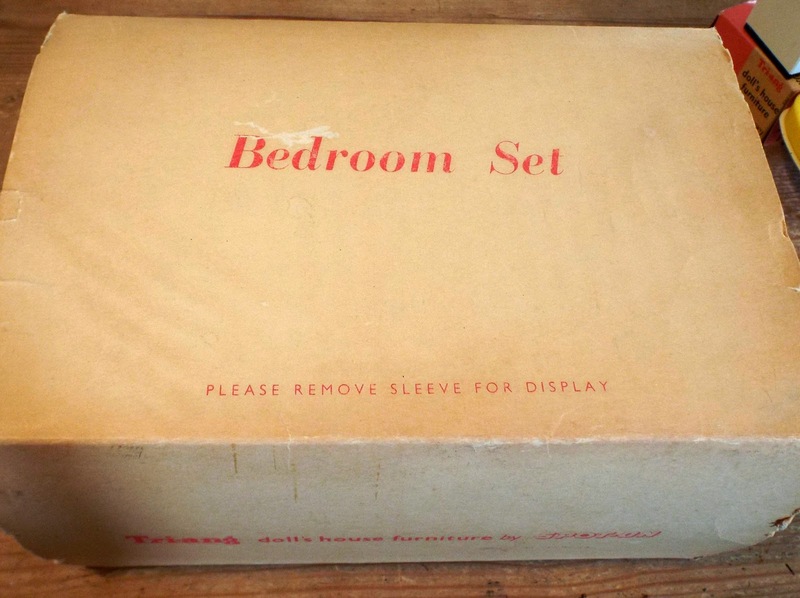 The set also came with a white table. 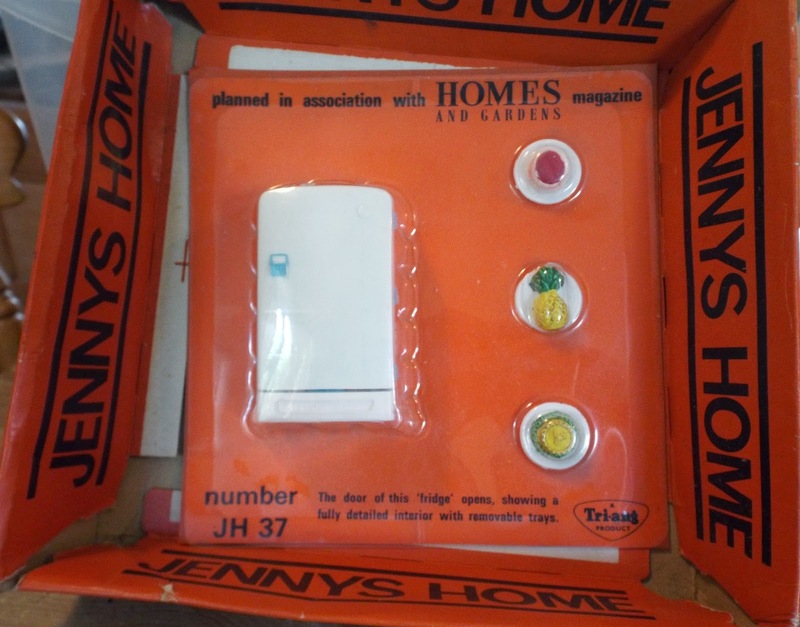 To have real glass doors on a child's toy obviously will not pass health and safety regulations of nowadays....so this is most definitely being sold as a collector's item only. 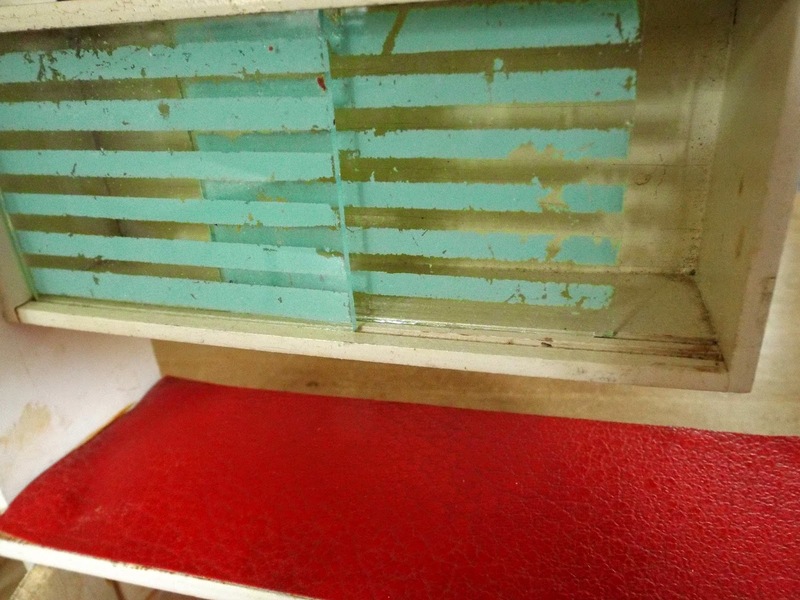 The long worktop is covered in some sort of red textured paper and is quite attractive. 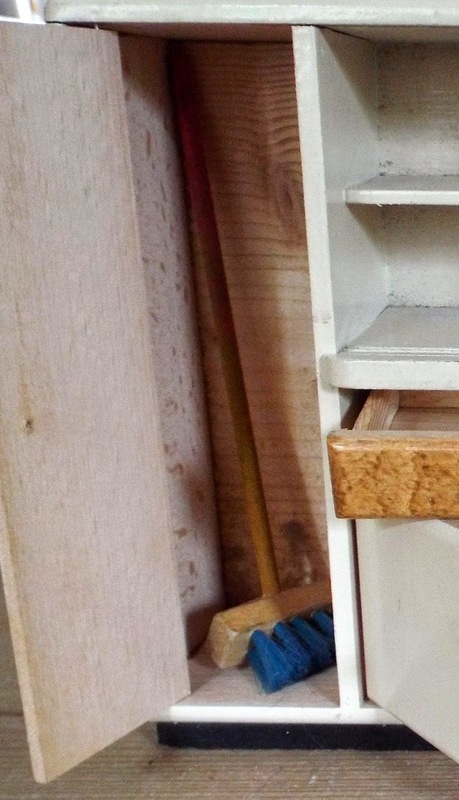 Am assuming that this little cupboard with a long silver wooden handle is meant to be the fridge. All the other door handles are metal. 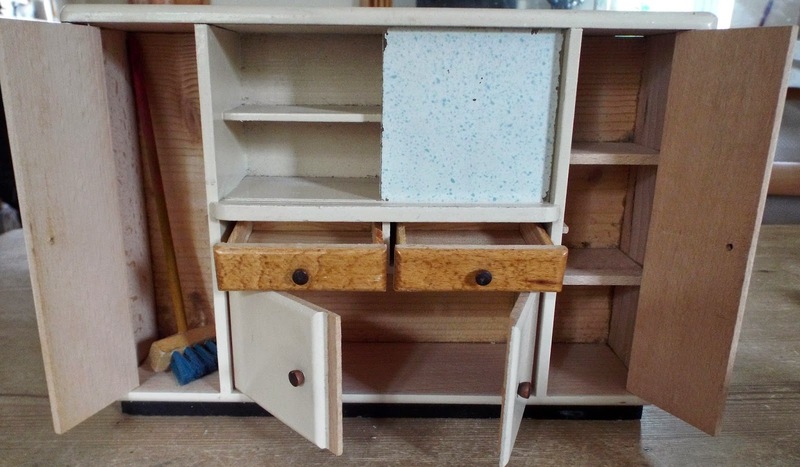 Interestingly, the two "drawer" fronts do not pull out as drawers but instead open as doors - very odd but wonderfully whacky! 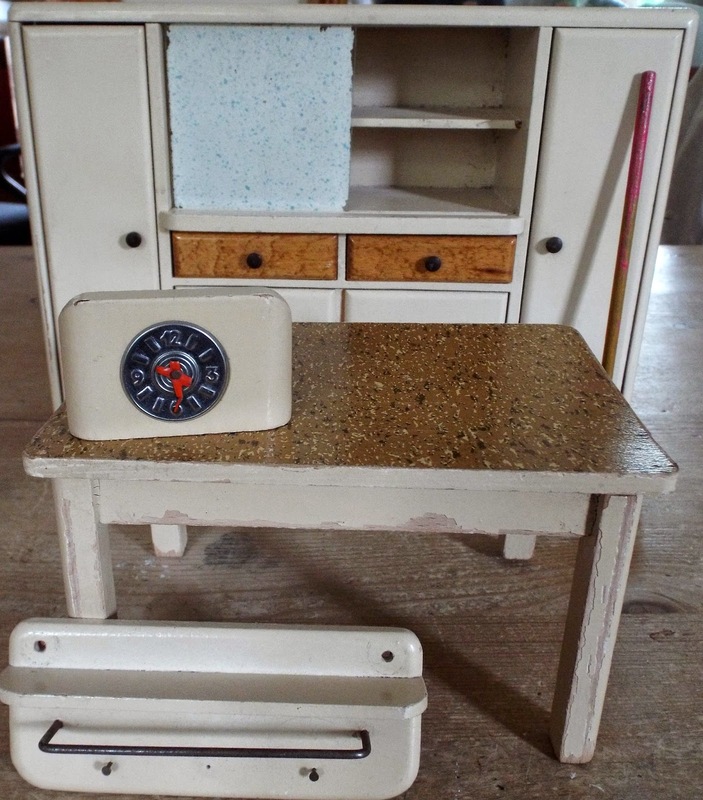 This is the first c1950s Crailsheimer kitchen that came into KT Miniatures and they do not come along very often here in the UK. 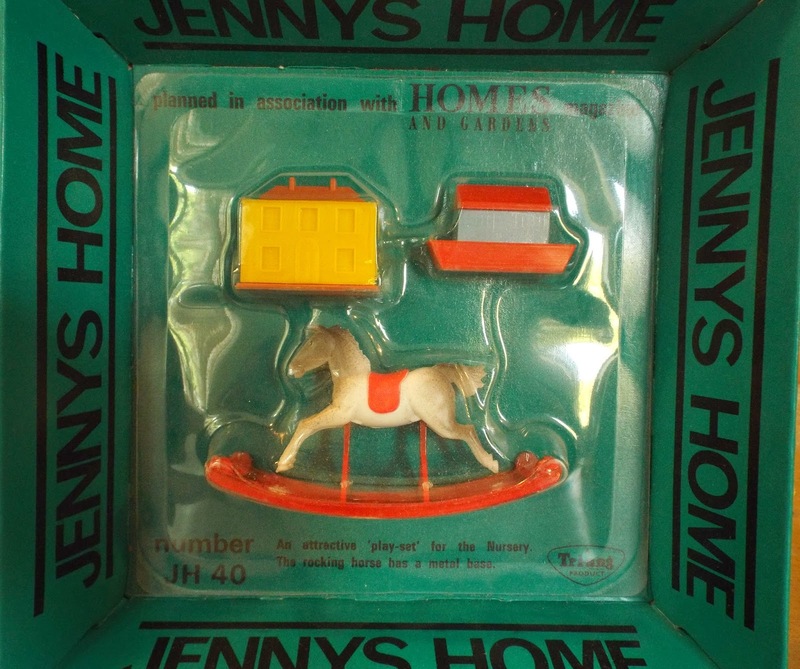 I love this and have kept this in a box for the past two years with every intention of using it within my own collection, but I simply have no dolls house suitable to put it in, so it is time for it to go onto a good home, where it can be appreciated. 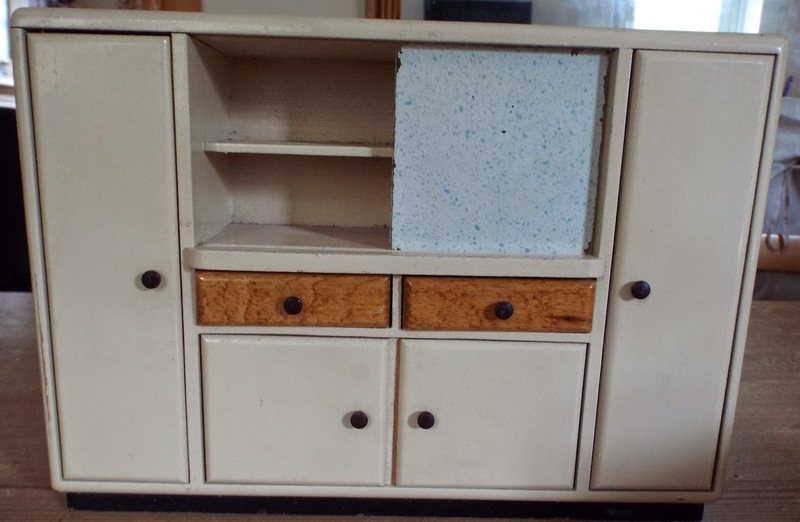 I am not sure if this is an early 1950s Crailsheimer Kitchen or not. Can anyone out there help me with identification? It is actually quite a bit bigger than the other kitchen above but not quite sure what scale you would call this...1/10th maybe? The unit itself measures 10 3/4" wide x 2 3/4" deep x 7 1/2" high. 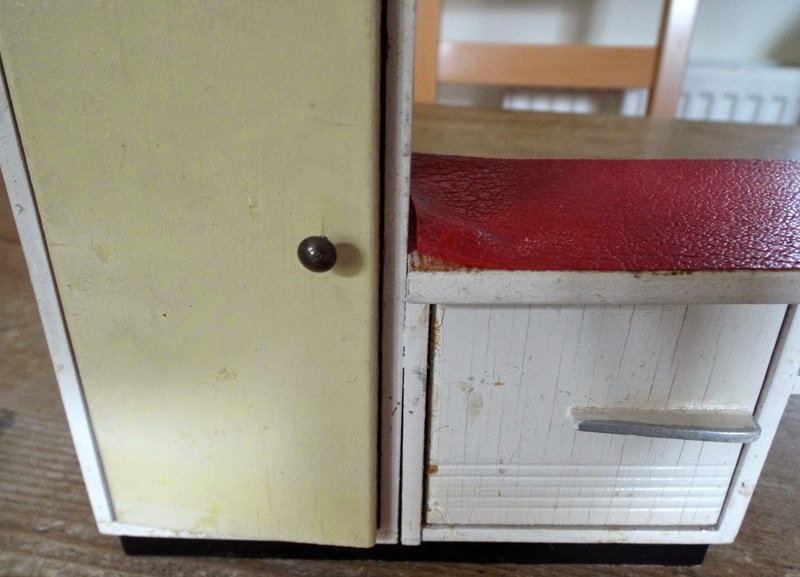 I have found some images with certain similarities to early 1950s Crailsheimer kitchens on the internet, but as yet, I have not found one completely identical. There is one remaining frosted sliding glass door.....obviously should have been two but the other is now long gone. The door is a bit loose and has a tendency to come adrift so needs to be handled with care. All doors and drawers open. Every door and drawer front have attractive dark wooden handles.The drawer fronts have a beautiful mottled varnished type finish. 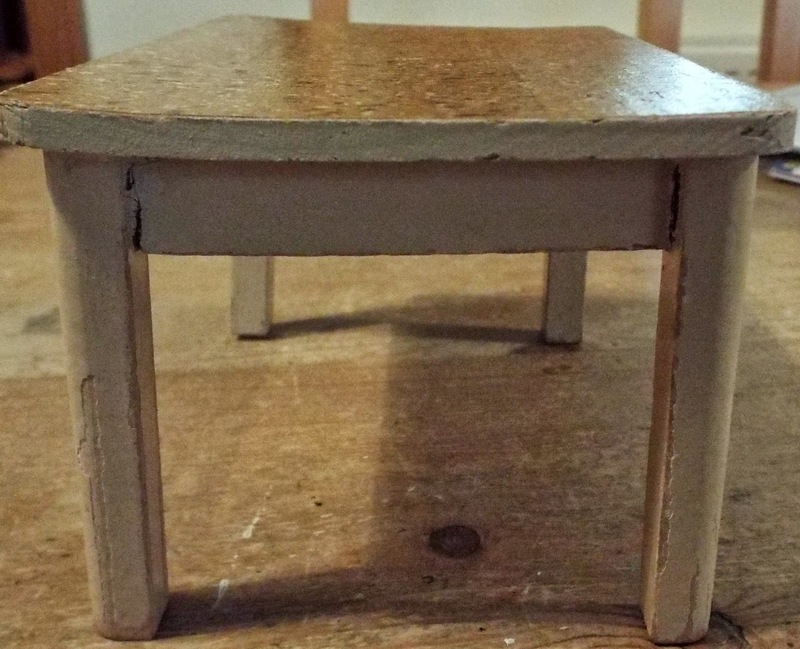 The wooden table is finished in the same cream/off white colour as the main unit and it measures 3 1/2" high - an average 1/12th scale table measures 2 1/2" high so this helps give an indication to the scale. The table top has a delightful very 1950s mottled finish - looks like some sort of paper covering? The top has become just a little warped and consequently the legs splay out just a little to, but this is just minor. 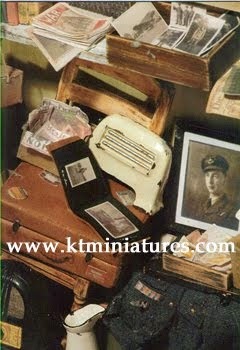 The shelf with towel rail is very distinctive, along with the wooden clock with metal clock face and moving red hands! One of the tiny "tack" hooks underneath the rail is missing, should be three judging by the tiny hole in the middle? 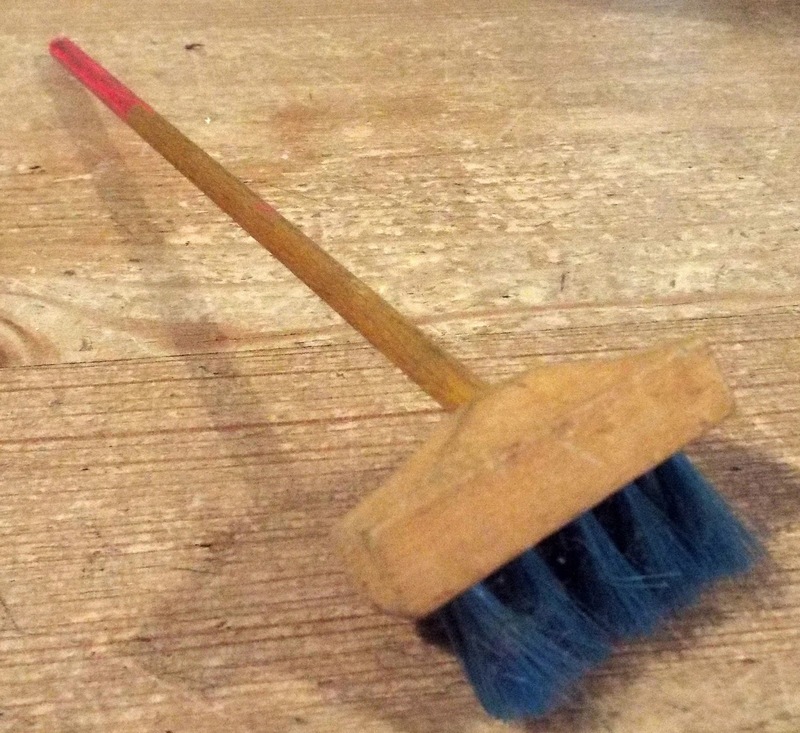 And finally, there is also a wooden broom with real bristles that accompanies this. 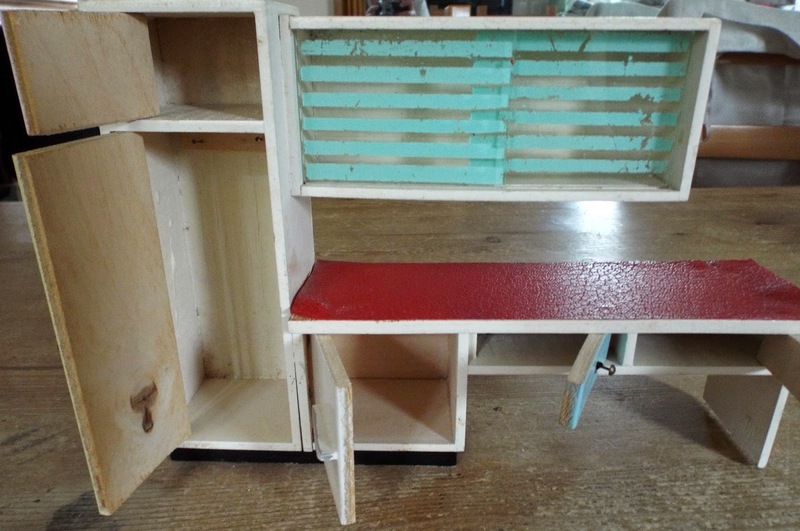 Am assuming that it is an original accessory to the kitchen unit, as it certainly fits inside the tall cupboard. 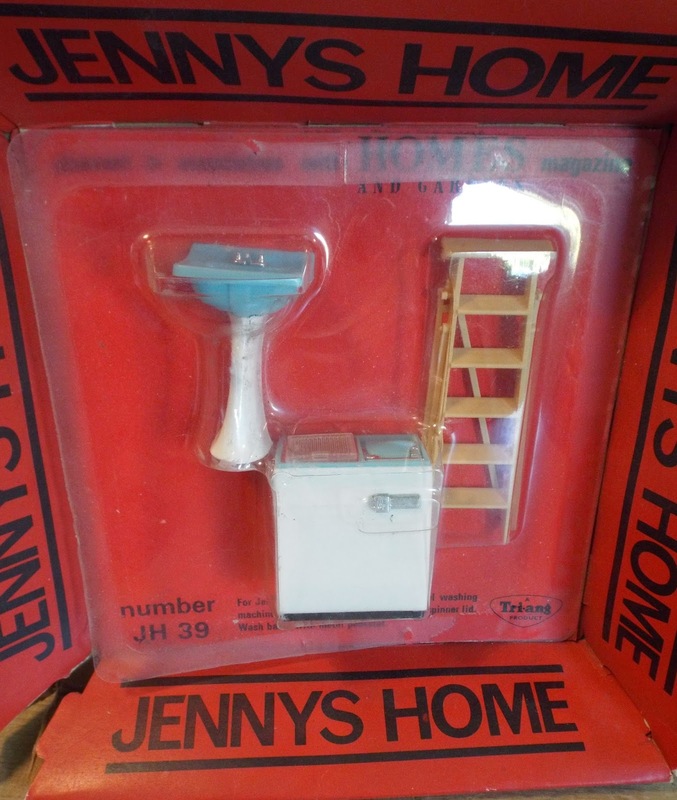 This second kitchen set has also been stashed away in a box for a couple of years now, along with the other kitchen. I had every intention of creating a special kitchen room box to display this particular kitchen as I absolutely love it. But reality has kicked in and I know that I simply will not have the time to do so. So folks, reluctantly I have put this up for sale and hope that someone else can enjoy it more...it does not deserve to sit in a box for another few years! Needless to say, if anyone out there can definitively identify this second kitchen, I would love to hear from you. 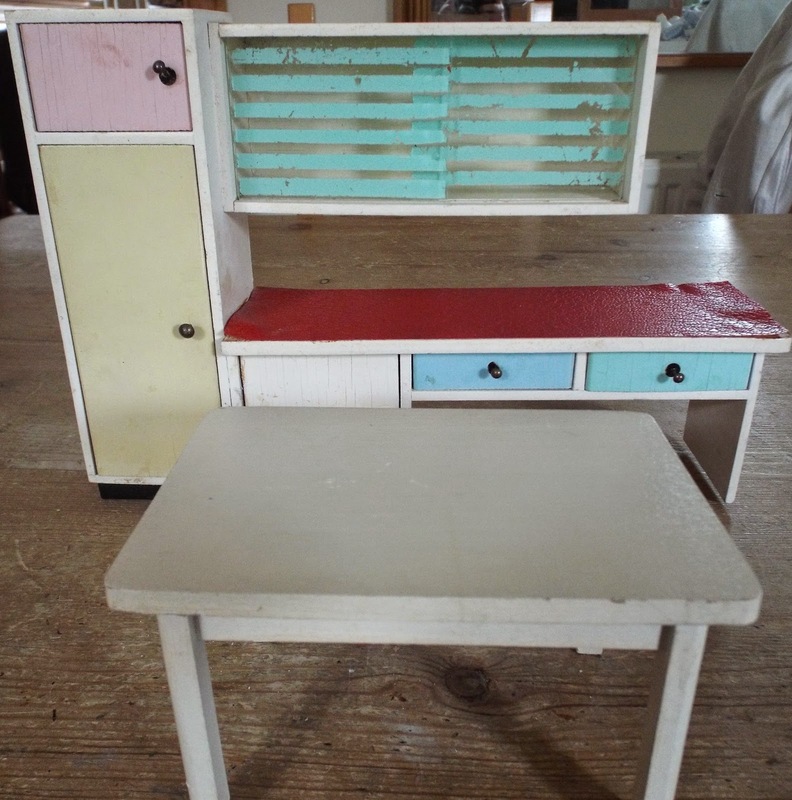 Some Of The Less Common c1960s Tri-ang Furniture & Accessories Up For Sale! 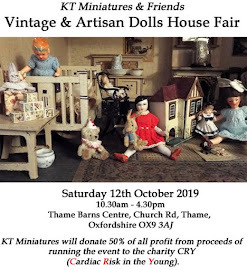 Today I have just begun to list on KT Miniatures website some rather lovely pieces from a massive Tri-ang collection that has been accumulated over many years. I'll begin with this gorgeous bed. 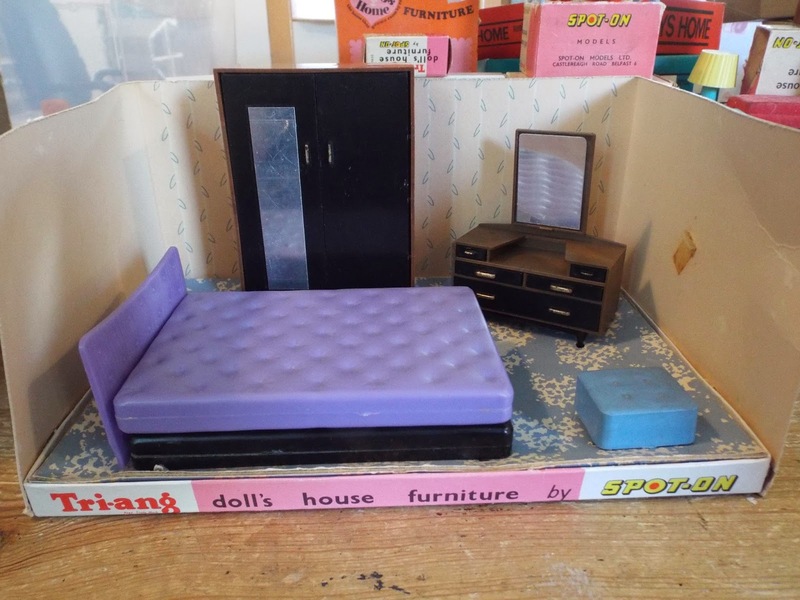 It is listed as a Polka Divan Bed in the early price lists and rarely do I ever get these in. This is the very first one I have ever handled that I can actually describe as being in good condition. As the spindle headboard is made from soft plastic and is extremely fragile, consequently it was prone to breakages. So it is so nice to have this fully intact example. 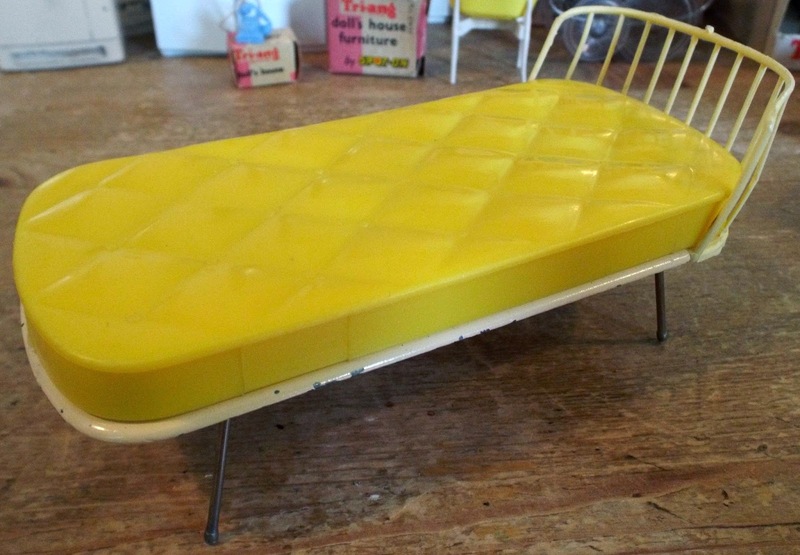 The whole thing is very heavy as the base is solid metal - the mattress is made from hard plastic. 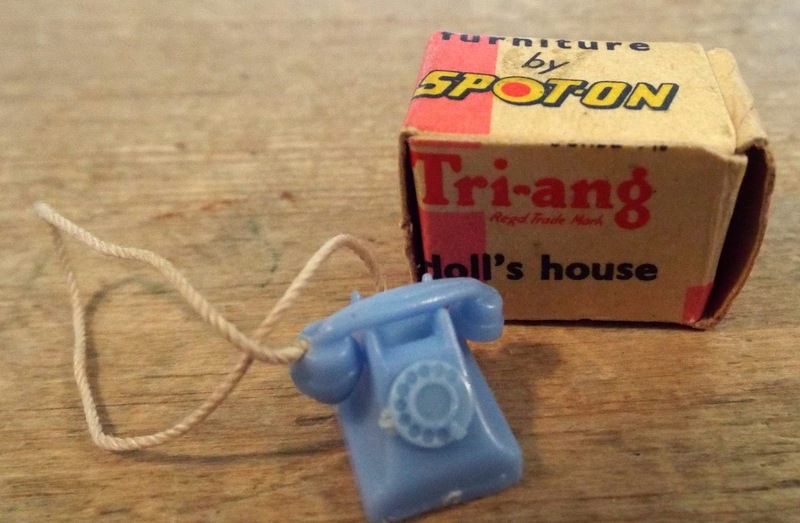 Here is a boxed Tri-ang Spot-On Telephone and this is a first for me, so I think we can say this is quite rare. What struck me on first handling is how tiny it is....although I had seen this in photos before, somehow I had always thought it was bigger...more like in size to the B&S phones....but nope, this is weenier still. It measures 3/8" wide and high, plus 7/16" deep. Then there is this boxed Tri-ang Spot-On coal scuttle. This all plastic scuttle does not come along fully intact that regularly and rarely does it come with the box. 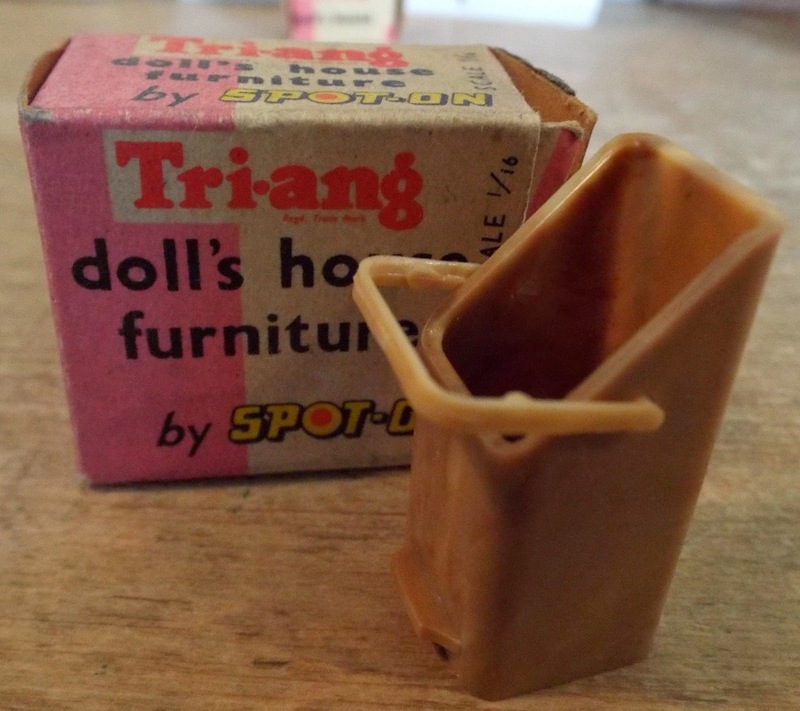 Interestingly Marion Osborne has commented in her latest Book Of Tri-ang Furniture that at the time that Tri-ang manufactured these earlier coal scuttles, they weren't actually making any fireplaces for dolls houses or making any dolls houses with fireplaces in them! Although I have sold bits of Tri-ang luggage before, it is the first time I have handled a Tri-ang "Hatbox". 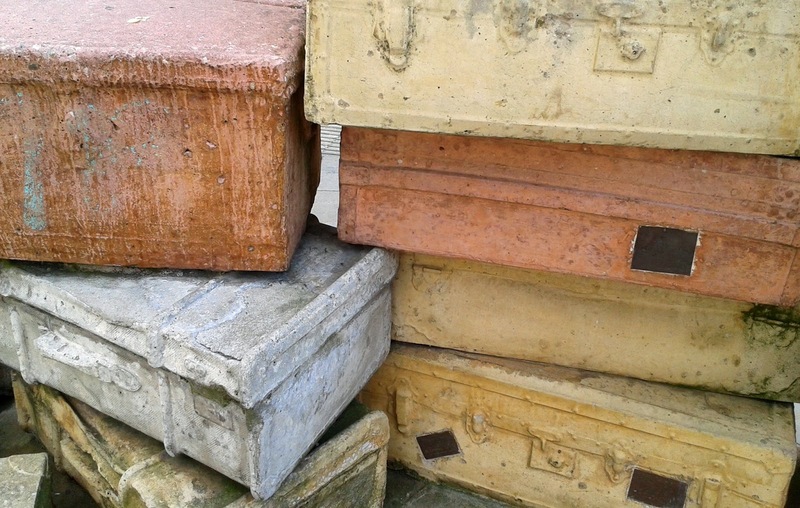 Both the plastic hatbox and suitcase open fully. 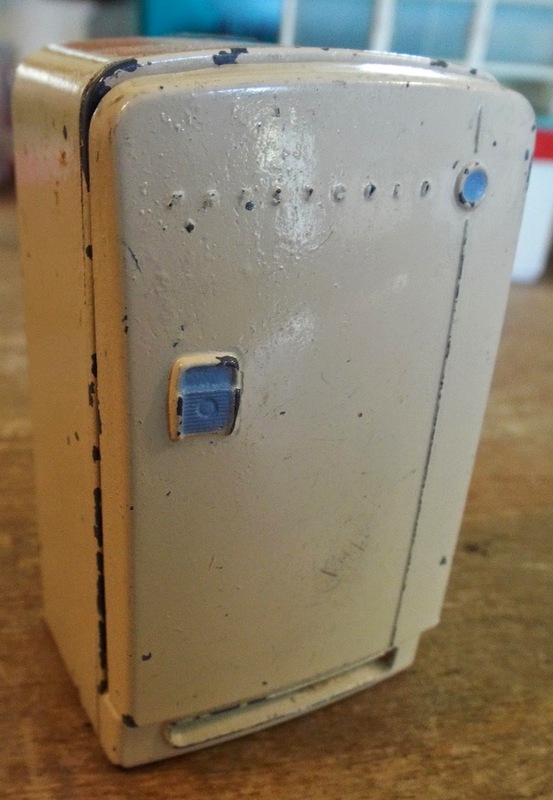 I have to say that the detail of the hinges are exquisite. At first I'd thought that it was a vanity case but nope, it was only when reading through the relevant section in Marion's book did I realise it is actually meant to be a hatbox! 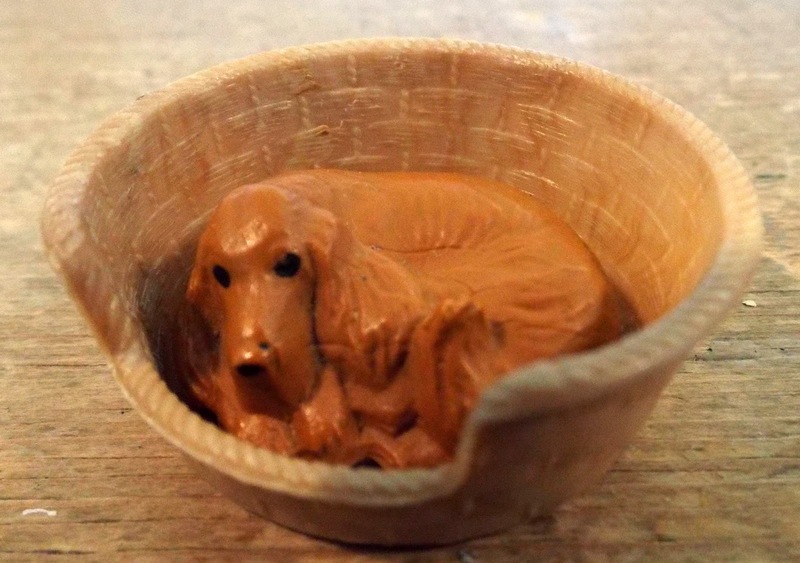 It is nice to have the Tri-ang dog AND the basket....rarely do I get these in. 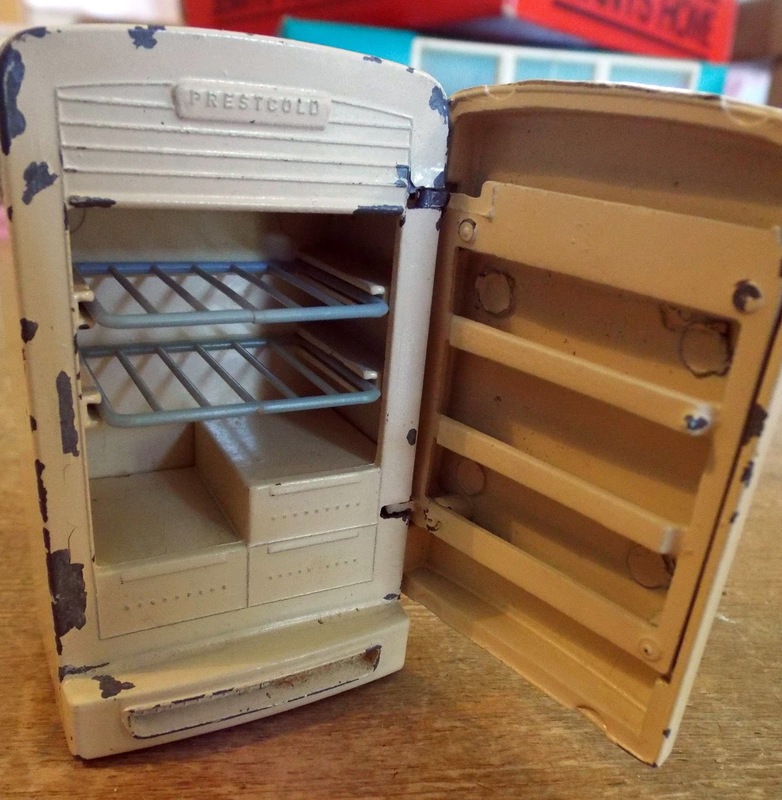 It is so lovely to have a fully intact metal Tri-ang Spot-On Prestcold fridge! Yep....I can truthfully say that both hinges on the door are present and correct plus both blue plastic shelves are there too. This is a very heavy but really attractive item. 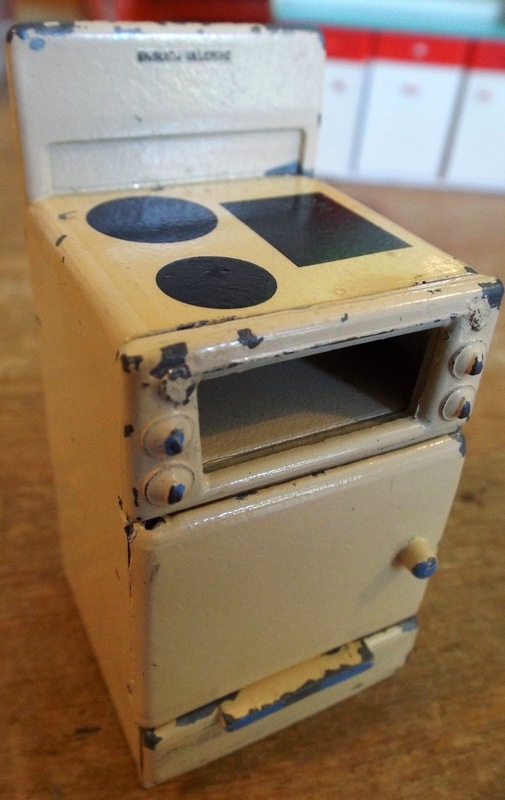 There is also a matching cream metal English Electric Cooker, another heavy item! 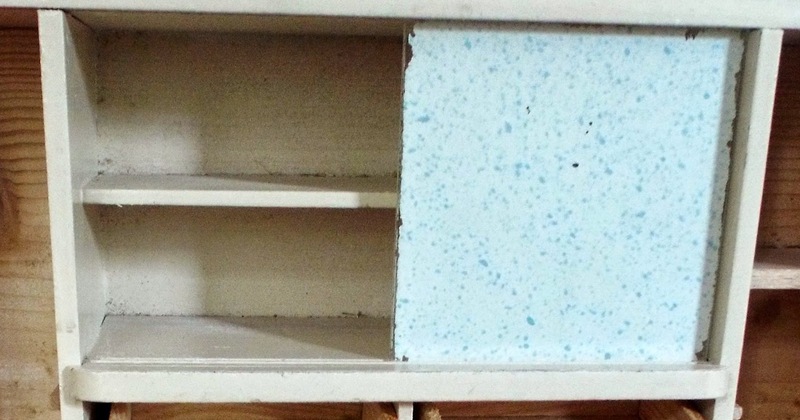 It has an opening oven door and inside are the original black plastic shelves. 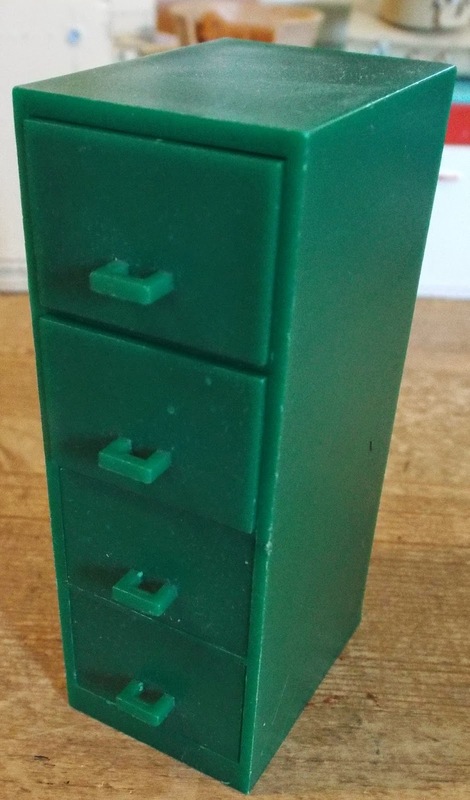 At the bottom is a pull out drawer. 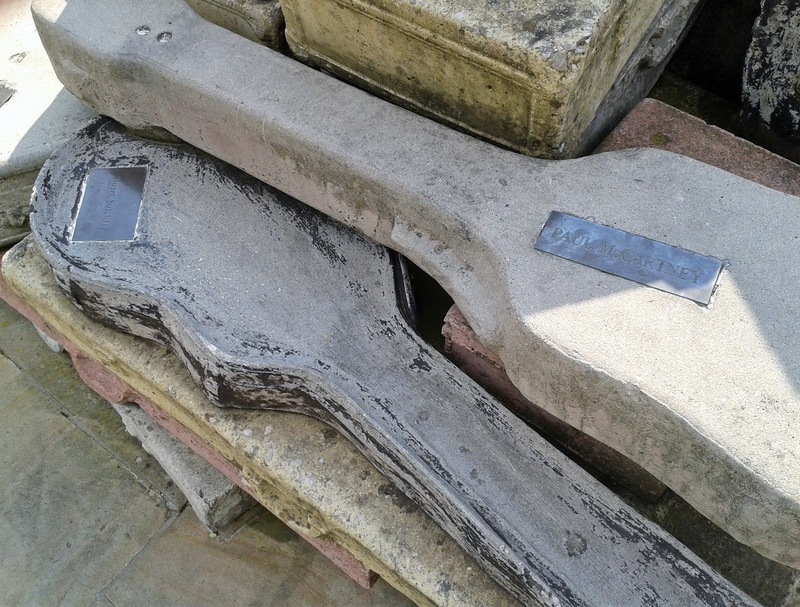 These earlier metal Tri-ang pieces are becoming more difficult to source these days.....the later white and red cookers are far more readily available....so this is a good opportunity for someone to purchase one of the more highly sought after cookers! 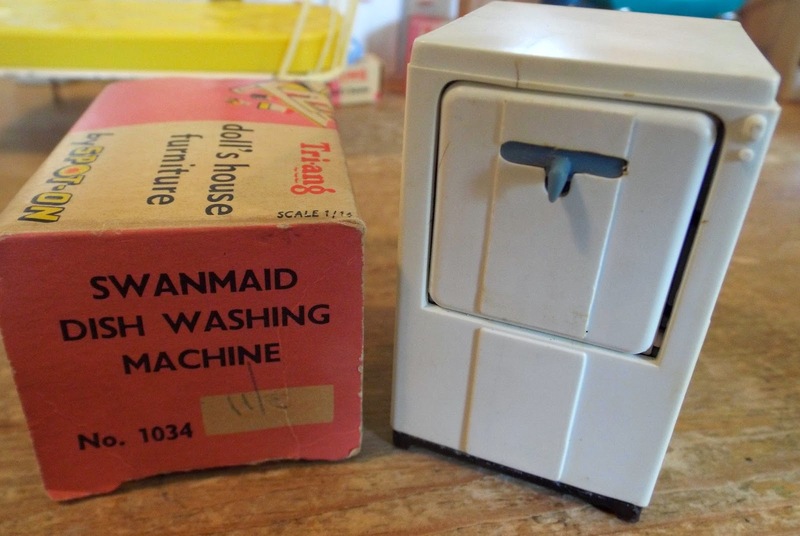 It is not often I get a Tri-ang dishwasher in and this one even has the original box. 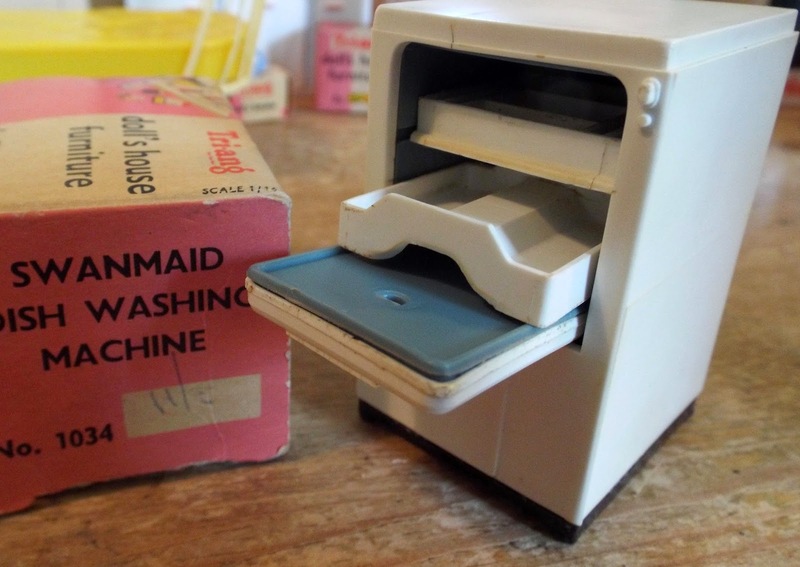 It's official title is a Swanmaid Dish Washing Machine. The door drops down and both racks can be pulled out a little...wonderful! 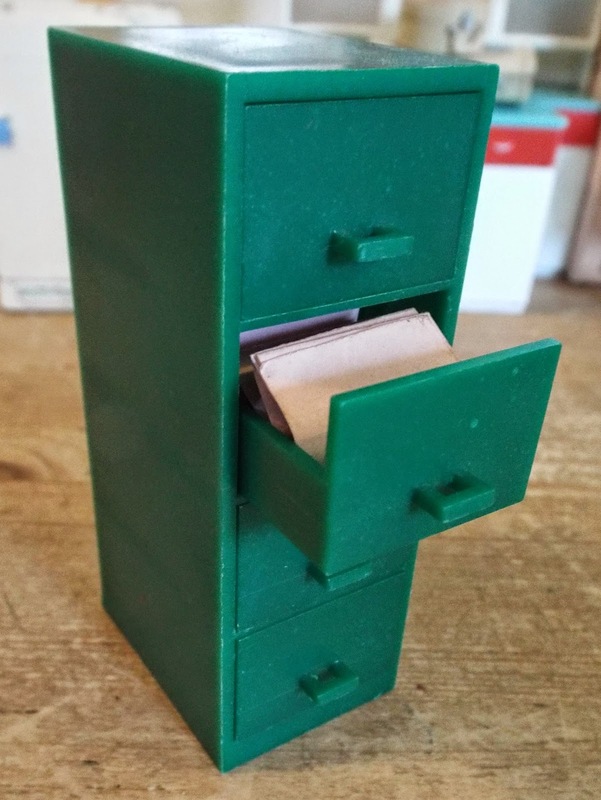 This green filing cabinet intrigues me.....it would have been quite an innovative piece in its time as I don't think any of the other dolls house manufacturers were making filing cabinets for dolls houses in the early 1960s...were they? 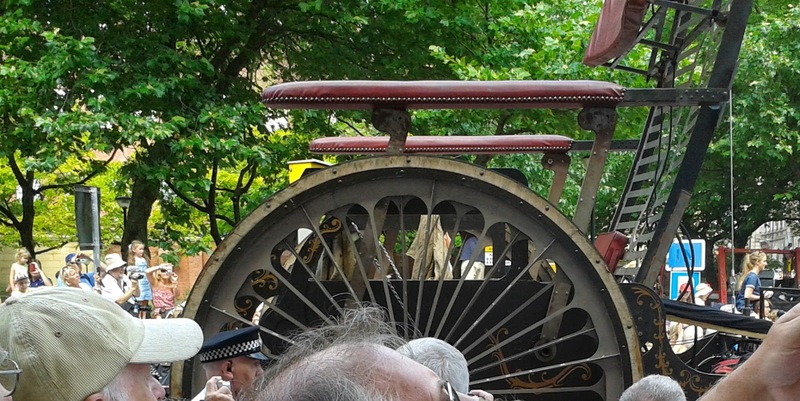 A real life sized one of these would not look out of place in our houses these days....just shows how some designs can stand the test of time, don't you think?